Seattle author and Fly Baby designer Peter M. Bowers passed away in April of 2003, just two weeks short of his 85th birthday. The world may remember him as the author of 26 books and over a thousand aviation articles, but he and the Fly Baby were an integral part of the Pacific Northwest homebuilding scene for more than fifty years. Pete was born in San Franciso in 1918. Like many boys growing up in the years between the World Wars, he was caught up in the explosive growth of aviation. He hung around the airports, he collected pictures of aircraft, and built models of airplanes. Where he differed from his contemporaries was in his scientific approach to his hobby. It wasn't enough to merely snap pictures of the airplanes that visited nearby airports. Pete noted the subtle differences between related types, and learned how to compose the images to best-preserve the distinctive features of each aircraft. He categorized his photo collection to allow faster access to data on particular aircraft. He studied how to make his models fly faster and farther. Like many who design and build model aircraft, he sent photos of his creations to the national magazines that covered the hobby. But instead of the usual blurry snapshots, the editors received clear, crisp photos and drawings, and well-written descriptions of the aircraft. Soon, Pete was writing for several national modelling magazines…while still in high school! His photographic skills kept improving. Soon, Pete was having photos published in non-aviation magazines such as LOOK. He began submitting photos to JANES ALL THE WORLD AIRCRAFT in 1941, and continued the practice for the next fifty-one years. Pete enrolled in the Boeing School of Aeronautics in Oakland, California in 1940. This was an intensive Aeronautical Engineering course, compressing a four-year program into two years. The coursework not only included the normal engineering classed, but a series of shop classes to qualify for his mechanic's license. Pearl Harbor led to Pete's joining the Engineering Cadet program for the U.S. Army Air Forces. Commissioned in 1943, he was eventually assigned to the China/Burma/India theater as a maintenance officer. Through this time, he maintained his fascination with photography. Film for his civilian camera was non-existant overseas, but he found that photo-reconnaissance aircraft usually didn't expose their whole film magazines while on a mission. Since the magazines didn't include light shielding to aid the transfer, he learned how to transfer these leftover snippets to his camera completely by feel, in total darkness. By the end of the war, his abilities to photograph and categorize aircraft led to his being placed in charge of the U.S. Army Aircraft Recognition Program. After leaving the Army in 1947, Pete was hired as an engineer by the Boeing Company in Seattle. He remained with Boeing until his retirement in 1988. During his time at Boeing, Pete worked a variety of tasks. Engineers who can write well are relatively rare, so he was often brought in as a "hired gun" to edit and improve company proposals. Engineers with Pete's understanding of aviation history are even rarer, so Pete was brought in when the company decided to make a full-scale, flying replica of the B&W, Boeing's first aircraft. The replica is currently in the Seattle Museum of flight. Pete also wrote historical articles for various company publications. Pete's legendary camera skills were occasionally used, as well. 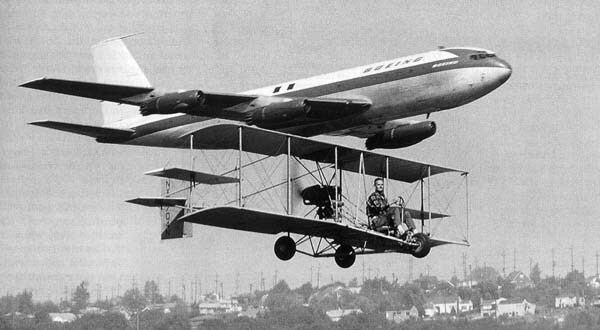 In one of the more famous cases, Pete arranged a "formation" photograph of the Dash 80, Boeing's 707 jetliner prototype…and Pete's own replica of a 1911 Curtiss Pusher. Pete arranged for the Dash 80 crew to fly a low approach at Boeing Field while Pete himself "flew" formation with a pickup truck carrying the cameraman. Soon after coming to Seattle, Pete accomplished one lifelong goal: Attaining his pilot's license. He soloed less than a year after starting at Boeing. For his own flying, Pete's primary interest was in low-powered or even non-powered aircraft. Over the years, he owned a number of aircraft, from a Ford-powered Pietenpol to the Curtiss replica, from a Sorrell biplane to a Baby Bowlus glider. Like many aeronautical engineers, Pete started thinking of building an aircraft of his own design. In the mid 1950s, he began designing what he called a "jazzy personal runabout," using a fuel-injected 85 HP Continental engine. The airplane would be made of wood, as Pete had no experience with any other construction material. Paul Poberezny had begun the Experimental Aircraft Association in 1952, and individual chapters were springing up all across the country. Pete's discussions with other Seattle-area pilots revealed others with an interest in building their own aircraft. In 1956, a meeting was held at Seattle's Roosevelt Hotel. A dozen or more interested pilots attended the formation meeting for Experimental Aircraft Association Chapter 26. Pete was elected the first President, a position he would hold for the next eight years. Regular meetings for the chapter began at Pete's home, which became the center for homebuilding in the Seattle area. Chapter 26 has been in operation for the last 47 years. In the meantime, Pete wasn't making any progress on his own design. A year after Chapter 26 was formed, Pete became part-owner of a homebuilt aircraft called the Story Special. The Story was the latest development in a trade study that had begun with Les Long in the 1930s. Long had experimented with low-powered aircraft, and had discovered that a low wing was the most efficient. His "Wimpy" capitalized on those results. Tom Story in Oregon built a Wimpy. After flying it for several years, he sold it to George Bogardus. Bogardus dubbed the airplane "Little Gee Bee." 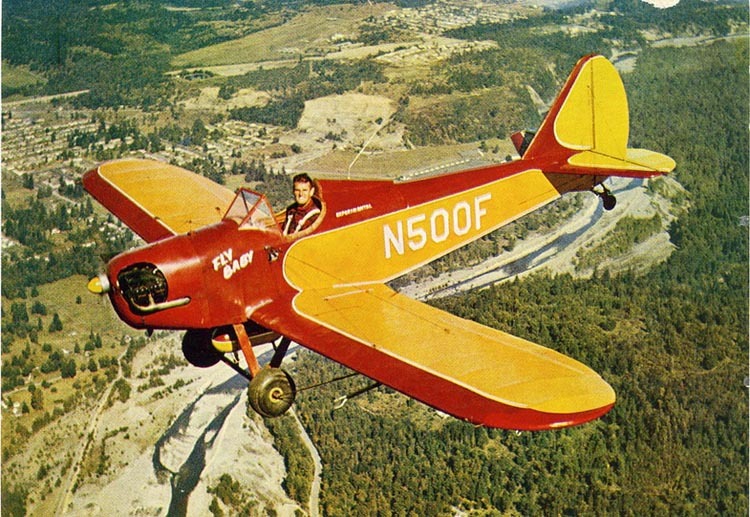 In the immediate post-war period, homebuilt aircraft were banned in nearly all States but Oregon. Bogardus flew Little Gee Bee to Washington DC to prove that homebuilts could be just as safe as production aircraft. The CAA eventually approved a new "Amateur Built" licensing category. After selling his Wimpy to Bogardus, Tom Story decided to build several more aircraft that included some of his own improvements. These were the Story Specials. Serial Number Two was flown for several years, then placed on sale. 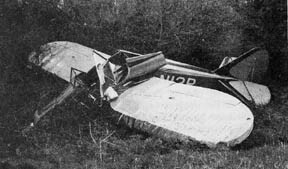 A charter member of Chapter 26, Cecil Hendricks, found the airplane and convinced Pete Bowers and another man to put the money together and buy the aircraft. The stage was set for the development of the Fly Baby. In 1957, the Experimental Aircraft Association announced its first design contest. The entrants would be judged on how easy they were to fly, how difficult and expensive they were to build. To encourage the lowest cost of ownership, the designs would have to have folding wings and be trailerable. The aircraft would essentially be EAA's first "standard" design; one of the conditions of the contest would be that the plans would be published in EAA's "Experimenter" magazine. The designs would be judged at the EAA's annual convention at Rockford in 1960. Pete had his original concept for his jazzy runabout, which he had given the name of one of his successful models of the 1930s: "Fly Baby." It didn't fit the ease of construction requirement of the contest, and its higher performance level would probably make it a bit tougher to fly, too. Pete designed a second airplane for the contest. Based on the well-proven aerodynamic layout of the Story Special, the Fly Baby II was a much simpler version of the original Fly Baby. A partner stepped forward to build the contest airplane while Pete built his high-performance design, but the partner was transferred soon after beginning construction. Pete bought the components to finish it for the contest. Pete trailered the Fly Baby, then registered N13P, to Rockford. Only the Fly Baby and one other aircraft were ready at the 1960 judging, and neither had flown off the required test time. The EAA decided to postpone the judging for another two years. Pete continued to fly and refine the airplane. He invited other local pilots to fly it as well. Six weeks before the judging in 1962, disaster struck: A pilot flying the aircraft got caught in the mountains and crashed. The tail surfaces were pretty much intact, and the wings weren't in too bad of shape, but the fuselage was broken and twisted. Pete got the aircraft back home. He was staring at it disconsolately in his garage, when two passersby stopped to talk. They were fellow Boeing engineers on temporary assignment to Seattle. They didn't see the task as insurmoutable, and they volunteered to pitch in. In one sense, the accident was a blessing in disguise. 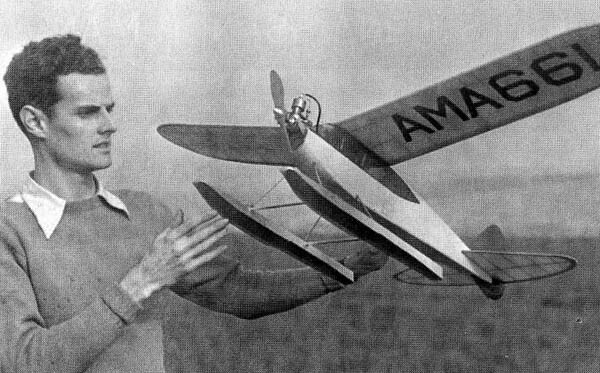 The Fly Baby had shown marginal pitch stability, and Pete had been contemplating adding a wider horizontal stabilizer. Pete and the two visitors managed to get a new fuselage built and the plane repaired in time for trailering to Rockford. One additional change: The FAA has rules that state short numbers (Like N13P) should be reserved for small aircraft that couldn't fit longer ones. The FAA demanded an affidavit that Pete's plane was such an example. It wasn't the case, so Pete asked for N500F as a replacement number and they painted the new number on the side of the new fuselage. Pete said the "F" was an abbreviation for the type of copying system to be used for the plans...and the "500" was how many plans he expected to sell. Before his death in 2004, Pete saw plan sales exceed 5,000. Eighteen individuals had originally entered the EAA design contest. Six aircraft were in attendance at Rockford '62. These included planes like the Turner T-40, the Nesmith Cougar, and the Spezio Tuholer. The Fly Baby came out the winner. 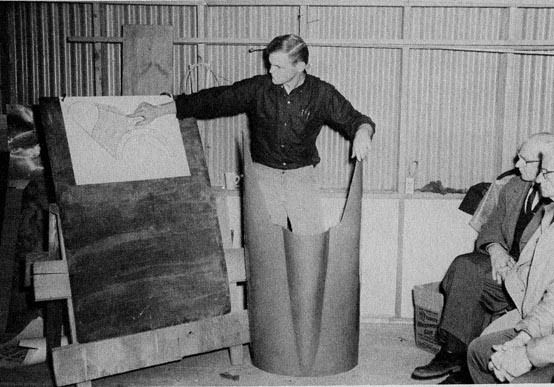 Pete wrote up the building instructions, which were published in "Experimenter" magazine over a two-year period. He had anticipated selling about 500 set of plans, but actual sales exceeded 5,000. The simple construction and basic aerodynamics of the Fly Baby lent itself to extensive experimentation. 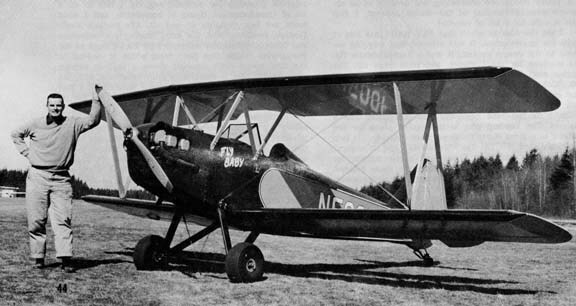 Pete used N500F, the prototype, as a test bed for modifications ranging from an externally-mounted baggage pod to a simple modification to incorporate biplane wings. One experiment had mixed results. Pete installed floats from an Aeronca to try out on the Fly Baby. Unfortunately, the buoyancy was not correct. 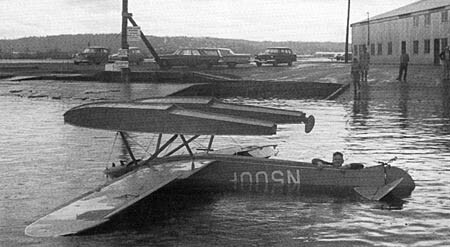 When Pete taxied N500F down the floatplane ramp at Renton field, the Fly Baby did a graceful forward somersault to the inverted position. Pete swam out from the submerged cockpit, and surfaced, shouting, "Get a camera! Get a camera!" One of the best-known cases was the biplane-wing adaptation. Contrary to popular opinion, this does not use the stock wing with just an upper wing and center section added...it's four new wing panels. Each wing panel is about 75% of the size of the wing panels on a monoplane Fly Baby...hence the total wing area is higher, but not twice that of the monoplane. The wings aren't just scaled copies of the stock wings, either...the biplane wings are actually swept back about seven degrees. If straight wings had been installed, the upper wing would have ended up directly above the cockpit, and access would have been very difficult. So Pete designed a center section to the top wing and installed it forward of the cockpit. If the upper wing had just been straight, then, the combined Center of Pressure would have shifted fairly far forward, giving the plane an aft CG. So Pete had to sweep the wings to keep the CG in the right spot. It's actually fairly attractive, visually... from certain angles, the plane looks a bit like a Bucker Jungmeister. The fuselage is essentially stock, with a couple of items added to secure the new upper wing center section. The aft cabane struts attached to the landing wire blocks in the cockpit, and the forward cabanes went to new fitting added to the firewall. A steel cable tang was added at the landing-gear mount location and the aft-spar mounting location to attach the new flying wires. With the fittings in place, though, the fuselage was good for either sets of wings. With two people working N500F could be swapped between monoplane and biplane wings in about an hour. The Biplane version was successful...or, at least, flew all right. The Fly Baby isn't a fast airplane to start with...adding a whole second wing and the extra bracing wires don't help. If you *must* have a biplane, the Fly Baby isn't a bad choice. But it's a lot less draggy as a monoplane. In another instance of experimentation, Pete decided to try to tow gliders with N500F. He installed a remote tow-cable release on the tailwheel spring of the Fly Baby, then went to the local FAA on a Friday with the waiver paperwork necessary for glider tow. The FAA inspector had just come back from vacation, and hurriedly signed off on the glider-tow waiver. Pete spent the weekend towing gliders aloft with the Fly Baby, especially his own Baby Bolus. Come Monday, the FAA inspector had whittled down the stack of papers that had collected in his in-basket over his vacation. There, he found a notice from FAA headquarters banning the issuance of glider-tow waivers to homebuilts! So N500F had just a single weekend of towing. The hook was retained, though, as it's very convenient for hand propping. Pete sold N500F to an Indiana man in the early 1990s. However, Bob Dempster of Renton purchased this historic aircraft and brought it back to the Pacific Northwest. It has subsequently been obtained by Seattle's Museum of Flight, and will soon be placed on display in the Great Gallery. Peter M. Bowers was inducted into the EAA Homebuilder's Hall of Fame in November, 2004. He joins a stellar list of famous homebuilders, including Tony Bingelis, Burt Rutan, and Richard Van Grunsven. In the past seventy years, Peter M. Bowers wrote dozens of books and well over a thousand aviation articles. He wrote almost 800 columns for the "General Aviation News." His books include nine editions of his Guide to Homebuilts, Unconventional Aircraft, Guide to Aviation Photography, Boeing Aircraft Since 1916, and Of Wings and Things, a compilation of his GAN columns.